The Republican Committee in Loudoun County, Va drew immediate condemnation from both sides of the aisle when an email featuring a ghoulish looking President Obama with a bullet hole in his head was circulated. Of course, the chairman of the committee tried to defend the email by saying it was the committees attempt at some lighthearted humor. Oh really...because we all know there's nothing funnier than a person with a bullet hole in their head...SMH! I swear these people just can't help themselves. They really are who we thought they were. Anytime someone can find humor in a depiction of a person with a bullet hole in his/her, there is something seriously wrong with the person. A Halloween-themed email from the Loudoun County, Va., Republican Committee was swiftly condemned by conservative and liberal groups today for featuring an image of a ghoulish-looking President Obama with a bullet hole through his head. 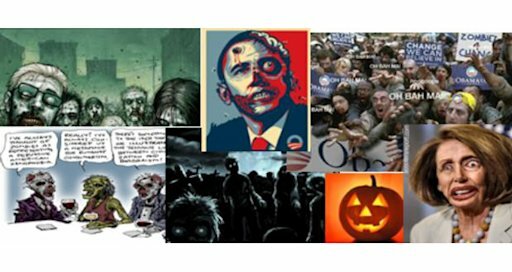 The message, with the subject line "Halloween 2011," invites supporters to a community parade where "we are going to vanquish the zombies with clear thinking conservative principles and a truckload of Republican candy." It also features a caricature of House Minority Leader Nancy pelosi, a jack-o-lantern, and cartoons of zombies. The email was first reported by the blog Too Conservative, which said the group had gone "way too far" and should be reported to the U.S. Secret Service. Mark Sell, chairman of the Loudoun County Republican Committee, explained that the email was a "light-hearted attempt to inject satire humor into the Halloween holiday." "Apparently, some individuals have interpreted an image of Barack Obama that appeared within the email as intending to portray the President as a victim of a violent crime. Nothing could be further from the truth," Sell said in a statement. "We deeply and sincerely apologize to the President and anyone who viewed the image if that was the impression that was left." Still, condemnation from Democrats and state and national Republicans has been swift and harsh. Virginia GOP Chairman Pat Mullins called the image "disgusting" and condemned its use "in the strongest possible terms." "We are in the process of contacting those responsible for the image to demand that they cease using it and immediately issue an apology," Mullins said. A Republican National Committee spokesman said the type of imagery in the Loudoun County GOP email "has no place in politics."